Journal of Nanjing Agricultural University, 2019, 42(2): 229-235. 刘唱, 杨洋, 俞静, 等. 不结球白菜BcCNL基因的克隆及功能分析[J]. 南京农业大学学报, 2019, 42(2): 229-235. 通信作者：李英, 教授, 博导, 主要从事蔬菜遗传育种和分子生物学研究, E-mail:yingli@njau.edu.cn. Abstract: [Objectives] The CC-NBS-LRR(coiled-coil-nucleotide binding-site-leucine-rich repeat, CNL) is a highly conserved plant disease resistance protein family. 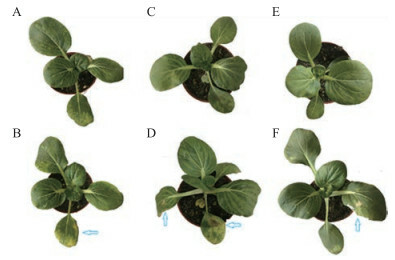 In this paper, we aimed to clone and study the role of CNL gene against downy mildew in non-heading Chinese cabbage(Brassica campestris ssp. chinensis). [Methods] The full length cDNA of BcCNL was cloned by variety 'Suzhouqing', analyzed by bioinformatics analysis, RT-qPCR detection, subcellular localization and virus-induced gene silencing(VIGS) validation. 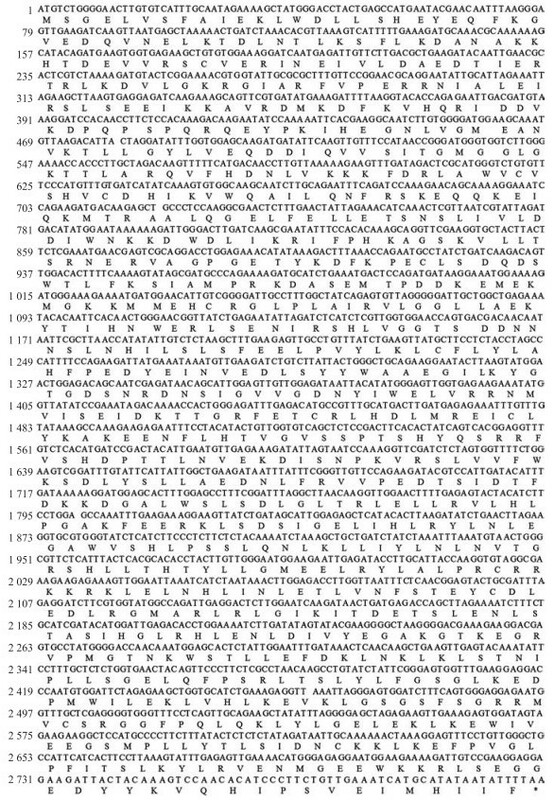 [Results] The BcCNL gene contained a 2 790 bp open reading frame, encoding 929 amino acids, with a molecular weight of 226.7 and an isoelectric point of 2.7. The evolutionary relationship between BcCNL and CNL protein of Brassica oleracea var. oleracea was the most recent, and BcCNL contained RX-CC, NB-ARC and LRR-3 domains. The subcellular localization of BcCNL protein was located in the cell membrane. 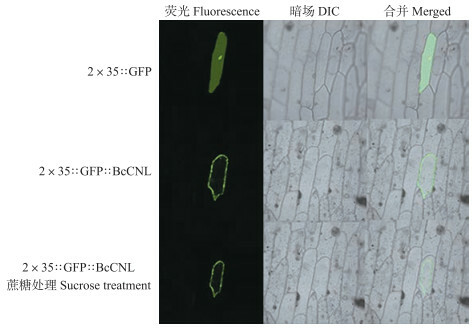 The expression of BcCNL gene in resistance variety 'Suzhouqing' was higher than that of susceptible variety 'Aijiaohuang' after infected with downy mildew. Silencing of BcCNL gene reduced the 'Suzhouqing' against downy mildew. [Conclusions] The BcCNL protein was highly conserved during evolution and was located in the cell membrane. 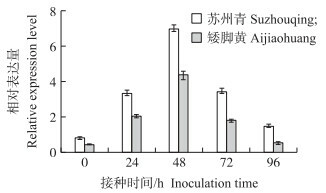 The silencing of the BcCNL gene reduced the 'Suzhouqing' against downy mildew. 图 6 转入pTY或pTY-BcCNL的‘苏州青’接种霜霉菌5 d后的表型 Fig. 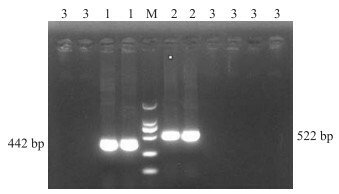 6 Phenotypes of'Suzhouqing'after transferred in plasmid pTY or pTY-BcCNL and after 5 days of infected with downy mildew A、B:转入pTY的植株Plant transferred in plasmid pTY; C、D:转入pTY-BcCNL的植株Plant transferred in plasmid pTY-BcCNL; E、F:正常植株Normal plant; B、D、F:侵染霜霉菌5 d后的表型Plant phenotype after 5 days of infected with downy mildew. 箭头指不同处理植株接种霜霉菌后叶片发病程度。The arrows indicate the degree of disease in the leaves of different treated plants inoculated with downy mildew. 图 7 用CP引物进行PCR检测植株体内病毒质粒转录产物 Fig. 7 Detection of viral plasmid transcripts in plants by PCR with CP primers M:DL2000 marker; 1:转入pTY的植株Plant transferred in plasmid pTY; 2:转入pTY-BcCNL的植株Plant transferred in plasmid pTY-BcCNL; 3:正常植株Normal plant. 图 8 转入pTY-BcCNL或pTY后发病植株BcCNL的表达水平 Fig. 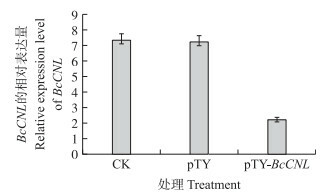 8 Expression level of BcCNL in the diseased plants after transferred in plasmid pTY-BcCNL or pTY CK:正常植株Normal plant; pTY:转入pTY的植株Plant transferred in plasmid pTY; pTY-BcCNL:转入pTY-BcCNL的植株Plant transferred in plasmid pTY-BcCNL. 侯喜林. 不结球白菜育种研究新进展[J]. 南京农业大学学报, 2003, 26(4): 111-115. 刘克钧, 朱月林, 侯喜林, 等. 不结球白菜抗病育种的研究. Ⅳ:不结球白菜抗芜菁花叶病、霜霉病及黑斑病的多抗性鉴定及筛选[J]. 南京农业大学学报, 1997, 20(3): 31-35. 申姗娜, 侯喜林. 不结球白菜感染霜霉病菌后防御物质及酶的变化[J]. 南京农业大学学报, 2009, 32(1): 23-26. 刘世拓, 肖栋, 许玉超, 等. 不结球白菜过氧化还原蛋白基因Brc2-Cys Prx的克隆和表达分析[J]. 南京农业大学学报, 2017, 40(1): 40-47. 程永安, 柯桂兰. 影响大白菜霜霉病抗性鉴定的因素[J]. 西北农业学报, 1995, 4(4): 69-72. Cheng Y A, Ke G L. Factors affecting evaluation of Chinese cabbage resistance to downy midew[J]. Acta Agriculturae Boreali-Occidentalis Sinica, 1995, 4(4): 69-72 (in Chinese with English abstract). 徐淑平, 卫志明. 基因枪的使用方法介绍[J]. 植物生理学通讯, 1998, 34(1): 41-43. Xu S P, Wei Z M. Introduction to method of microprojectile bombardment and its application[J]. Plant Physiology Communications, 1998, 34(1): 41-43 (in Chinese). 杨学东, 戴薇, 张昌伟, 等. 白菜病毒诱导基因沉默技术体系的建立[J]. 园艺学报, 2012, 39(11): 2168-2174. Yang X D, Dai W, Zhang C W, et al. The technology system establishment of VIGS in non-heading Chinese cabbage[J]. Acta Horticulturae Sinica, 2012, 39(11): 2168-2174 (in Chinese with English abstract). 陈俏丽, 王峰, 李丹蕾, 等. '大白谷'CC-NBS-LRR蛋白编码基因抗干尖线虫侵染时空表达研究[J]. 中国农学通报, 2015, 31(21): 279-283. 孙威, 许奕, 许桂莺, 等. 病毒诱导的基因沉默及其在植物研究中的应用[J]. 生物技术通报, 2015, 31(10): 105-110. Sun W, Xu Y, Xu G Y, et al. Virus-induced gene silencing and its application in plant research[J]. Biotechnology Bulletin, 2015, 31(10): 105-110 (in Chinese with English abstract).